The best-selling duo of all time, Brooks & Dunn’s eagerly-awaited collaboration project REBOOT is available today. To celebrate the release, the duo's street week is stacked with a string of national TV appearances. 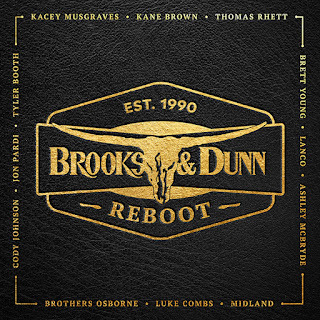 Fans will be able to tune in to the live debut of tracks taken from REBOOT when the duo performs in Las Vegas with Luke Combs on Academy of Country Music Awards for a high-energy version of “Brand New Man” on Sunday (4/7) at 7pm CT on CBS. They will then head to New York City with Midland for The Tonight Show Starring Jimmy Fallon for a special performance of “Boot Scootin’ Boogie” on Tuesday (4/9) at 11:35pm CT on NBC. The duo will also continue their roles as guest advisors to Blake Shelton on The Voice this week, offering their expertise to contestants on April 8, 9 on NBC at 8p ET/PT. For more information visit: www.brooks-dunn.com.